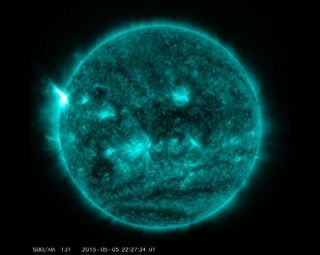 The X-class solar flare — the most powerful category of sun storm — erupted Tuesday from a sunspot called Active Region 2339 (AR2339), peaking at 6:11 p.m. EDT (2211 GMT). NASA's Solar Dynamics Observatory spacecraft captured a gorgeous video of the solar flare, recording it in multiple wavelengths of light. "Given the impulsive nature of this event, as well as the source location on the eastern limb of the sun, we are not expecting a radiation storm at Earth," scientists with the U.S. Space Weather Prediction Center (SWPC) in Boulder, Colorado, which is overseen by the National Oceanic and Atmospheric Administration, wrote in an update Tuesday evening. "We will be on the lookout for new imagery from the NASA SOHO [Solar and Heliospheric Observatory] mission to determine if there was an associated coronal mass ejection (CME) with this event," they added. "Given the same logic above, however, we do not expect there to be one that would impact Earth." CMEs are massive clouds of solar particles rocketed into space at millions of miles per hour. (Solar flares, by contrast, are blasts of high-energy radiation.) CMEs that hit Earth can trigger geomagnetic storms that can disrupt power grids and satellite navigation. Scientists classify strong solar flares into three categories: C (weakest), M (mid-level) and X (the most powerful). X flares are 10 times more potent than M flares. Wednesday's outburst clocked in at X2.7, outranking the previous flare champion of 2015 — an X2.2 storm that erupted March 11 from a sunspot known as AR12297. There could be more sun-storm action coming soon, SWPC researchers said. "We are expecting several active regions to be rotating onto the visible disk later this week and into the weekend," they wrote in the update. "We have observed a few energetic CMEs on the back side of the sun with these regions, so we expect that overall solar activity will be on the rise in the short to medium term."